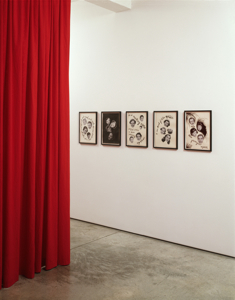 If the hermetic, prolific artist, Henry Darger, had been given a chance to choose another life, perhaps he would’ve have ended up like Donald Urquhart—drawing pictures of schoolgirls playing hide-and-go-seek on to the crisp white walls of one of London’s nonpareil galleries. Urquhart’s exhibition 52 Girls at Maureen Paley is a charming miscalculation that can be blamed on the B-52’s song from which Urquhart takes the title—“It was only when I was answering a pub quiz two years ago that I learned of my error and remembered its source (there are only 50 states in the USA)”. 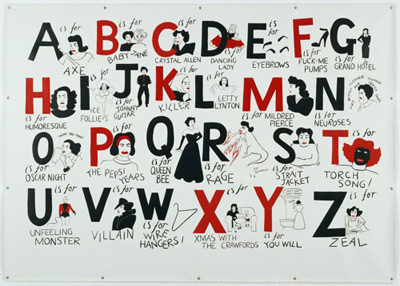 The black and white illustrations reveal transvestite identities, revised pedagogical mnemonics, saturnine iconic women—all the puzzle pieces that compose Urquhart’s biography. 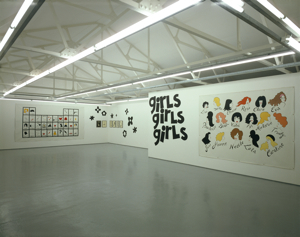 The exhibition is introduced by the affirmative nature of women, their desire to say yes over and over (yeahyeahyeah). With the turn of a corner, you find the less positive sides of womanhood. Urquhart’s characters wear “cryallnight mascara” and drown in red wine. In his periodical table, elements consist of “insomnia”, “burnt toast” and “onion tears.” But where there is frown, there is a mischievous smile; where pain lingers, there is also lingerie. His women are real, especially the men (Paulette, Nettle, Yvonne…). 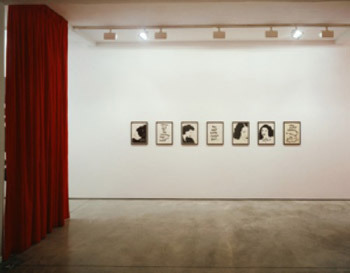 All of Urquhart’s drawings started out as club flyers for the Beautiful Bend, a London cabaret club he co-founded with Sheila Tequila and DJ Harvey. Shortly after, he was short-listed for the 2005 Becks Futures drawing prize (for which he created Darnley, a perfume that smells like the queer murdered husband of Mary, Queen of Scots). Everyone likes Urquhart and the people he likes—and, less so, doesn’t like—make it into his art. From the trannies at Beautiful Bend to Little Eddie Beale from Grey Gardens, his characters share the quality of being lonely. He is interested in the strange stories behind popular, isolated beauties. At the same time, he is interested in grouping very particular quantities of women and the songs that count: 52 Girls was followed by a Nina Simone-inspired project he did for MAP magazine called Four Women. His signature drag song happens to be “Is that All There Is?” It is more about lack than gain, but he doesn’t seem to be whining. In fact, it reminds me of a particular Hollywood non-story. Despite a friend’s warning on the lingering olfactory power of dead animal on the human nostril, David Lynch intentionally inhaled the scent of a forgotten dog carcass. Two days later he took a deep breath and, with great satisfaction, claimed he could still smell the dog. Urquhart doesn’t have Lynch’s appetite, but he embraces a similar methodology. He doesn’t shield himself from the horror behind delightful, smiling ladies. He brings them to life the only way one can—by becoming them first. *The show travels to Jack Hanley in Los Angeles, January of 2008. — Veronica Kavass is a writer based in London.